Gonna wai with a little help from my friends. 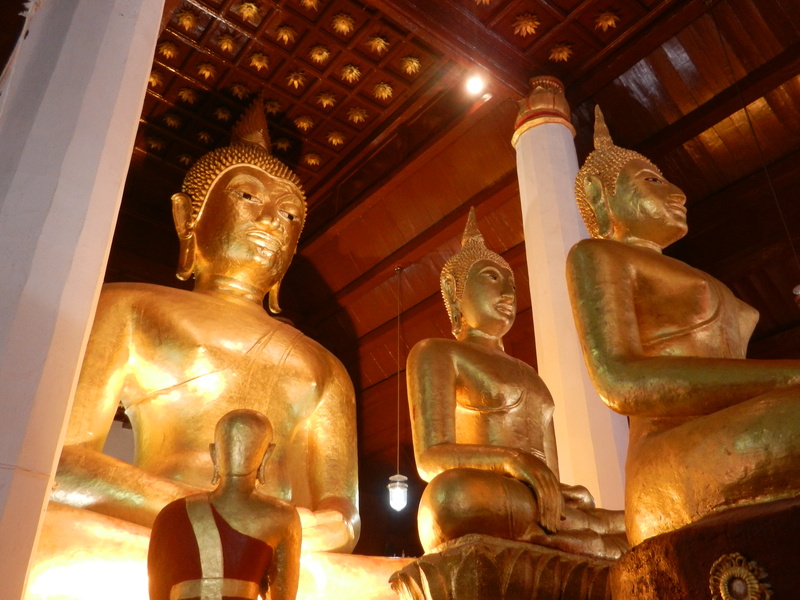 Buddha statues comprise a major Thai art form. But most books on Thai art don’t look at them with Thai eyes. Here, we’ll begin to delve into the infinite depths of Thai perspectives. 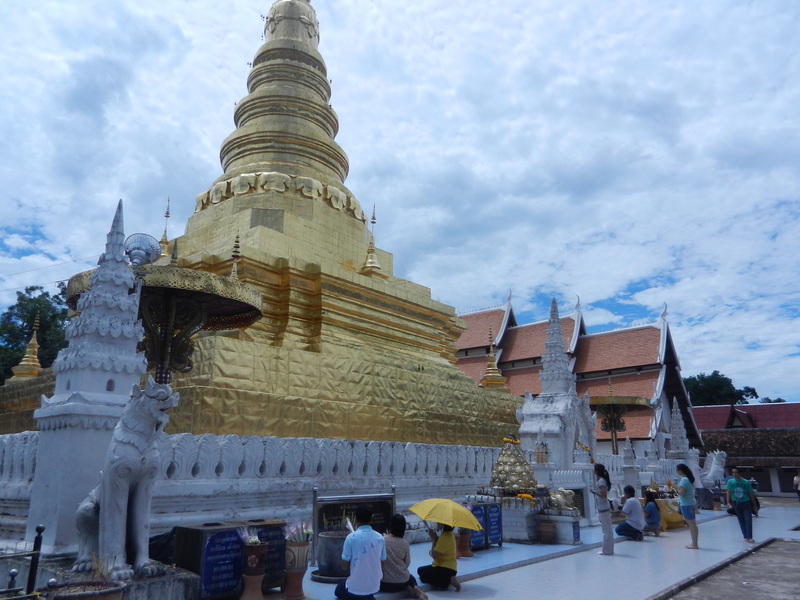 I took the above photo in a wat (Phra That Chae Haeng) in a northern Thai town called Nan. As beautiful as it is, it’s a common sight throughout the country. Most of the hundreds of wat’s I explored in Thailand with an operating meditation hall had several Buddha statues. There was always a main figure. It was the largest, and placed in the center of the altar. But several others surrounded it, and most faced the entrance. Art books examine Buddha statues singly, and they describe their details. But they miss a key aspect of Thai perspective. 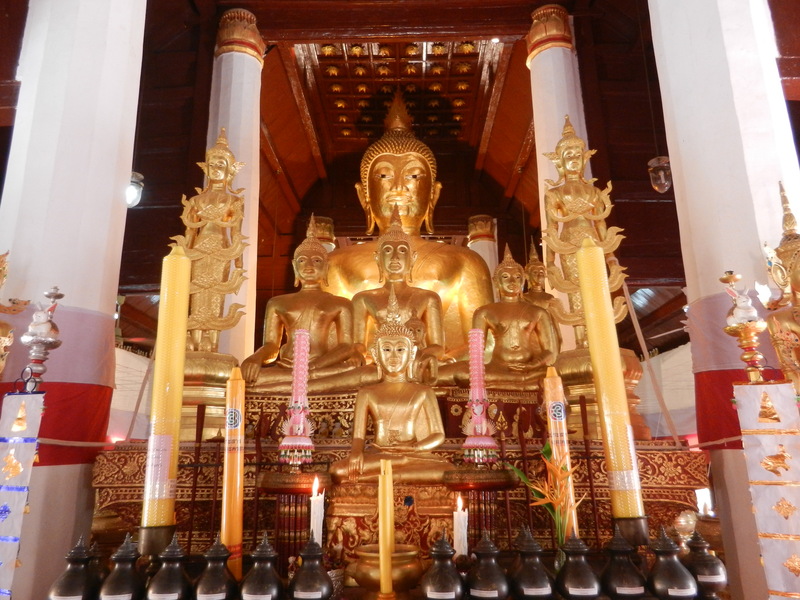 The last post, on the Sukhothai Buddha, shows that each statue’s sinuous contours and glowing surfaces make it seem to radiate energy in a gentle way which bestows grace on people who kneel before it. But several statues close to each other change the perspective from the individual object. 1. Their flowing forms and golden surfaces blend. They don’t have the the straight lines and detailed features of Italian Renaissance art, which developed at the same time that Thai art was perfected. Their surfaces aren’t blunt and confrontational, and they don’t invite close scrutiny of details. Instead they blend into a flow of graceful energy. 2. The perspective slowly flows as you amble around them. I took the above three photos of the same statues. Being close together, statues’ forms and glows reflect each other, and the view slowly changes as you move. It’s different every few seconds, and it’s always beautiful. This slow flowing motion makes the sense of gentle energy more real. The perspective is kinetic–it doesn’t command the whole from one static viewing point, like the 3 dimensional perspective that Florentines theorized in the 15th century. But though you can never see the whole, the view assumes infinite varieties, which are always enchanting and graceful. 3. This flow of grace includes you and your companions. Thais don’t usually examine details of these sculptures from a distance, as most Westerners see statues in museums. 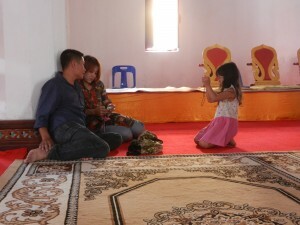 Most kneel, bow three times and pray. They often hang around a bit and enjoy their families. They’re always respectful, but not stilted. Parents let their children play as long as they don’t disturb others. Everyone’s relaxed movements seem to receive and amplify the graceful energy coming from the statues. Everyone meshes in the same flow of life-forms. Forms flow as beautifully outside. 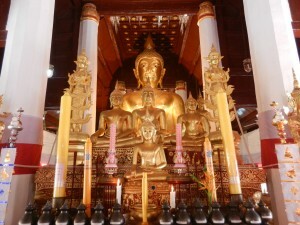 The above picture is from Wat Chae Haeng’s center. 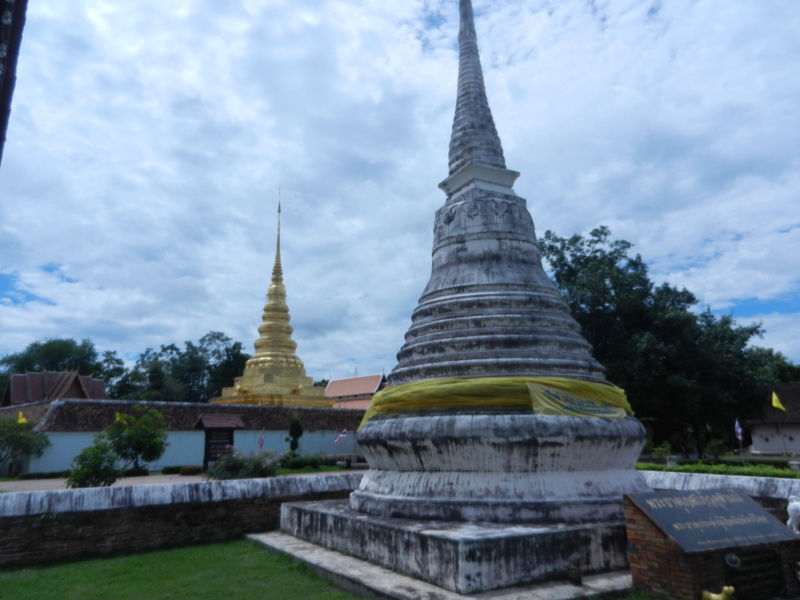 Its main stupa is on the left and the assembly hall with the Buddha statues is on the right. The above shot’s from outside the central compound, looking towards the main stupa. 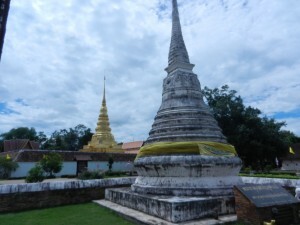 As you amble through the wat, all its stupas, halls and trees slowly flow together as though the whole area is a relaxed field of energy. Nothing exists as a separate object. 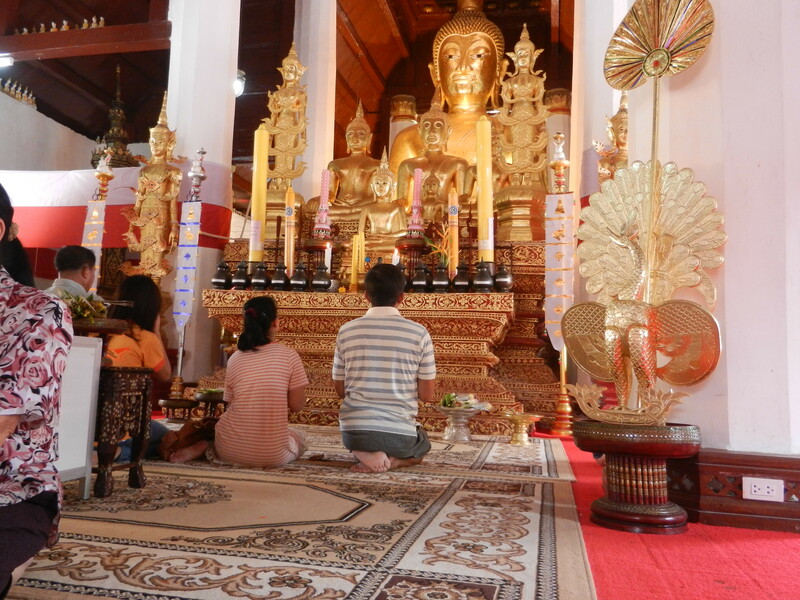 All things blend into a richly textured and tolerant whole which Thais have seen as the basis of society, and which reflects the Buddha’s compassion. They comprise a beautiful landscape which can be enjoyed without ever being exhausted. No lines or blunt surfaces hem your gaze in–you’re free to meander and find more enchantments. 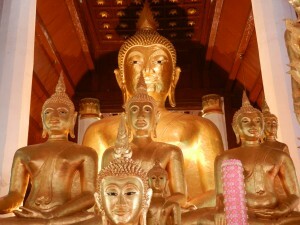 To enjoy more aspects of Thai perspectives, you can flow into the next post on Thai art.